So, apparently the Excel to thought paste does not work on the Mac side. Creating a simple nested test for thoughts results in a single long thought pasted into PB. 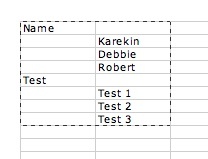 The attached Excel test leads to the attached thought when pasted into PB. Any word on whether this issue is going to be resolved? I have tried pasting from excel, tried saving as xml and pasting, tried a variety of different outline formats that produce xml. The pasting of thoughts from this format simply does not work. Just to be clear, XML based importing of data is only designed to work with XML that is in compliance with PersonalBrain's XML format. The problem originally posted about pasting from Excel under Mac OS seems to be related to the way tabs are being handled by Mac OS Excel. We're looking into this now.